We are different in our approach to helping you achieve your health and vitality goals. See, we work with you both neurologically and metabolically. In our office, the mission is to help you reach your health goals by going beyond simply your symptoms, but discovering the cause of what is allowing your present health condition to persist despite the many options you may have tried to this point. After surfing this site you have plenty of information. Now is the time to take action and schedule your first consultation. During your first consultation with Dr. McGaughey please bring all your imaging, blood work, and any other testing you feel is pertinent to your case. You will also need to bring the forms you downloaded and filled out along with a pair of shorts and short sleeve shirt to wear during the examination. You will need to set aside approximately one hour with Dr. McGaughey as he will perform a complete neurological examination to determine which areas of your body are being affected the most by your condition. At the end of the first visit, Dr. McGaughey will know if you will be able to be helped and what further testing might be needed. "Does Dr. McGaughey work on you the first day?" is a question we get all the time. Due to the fact everyone is different and each case is different he will not know until the end of the exam, at which point he will let you know. 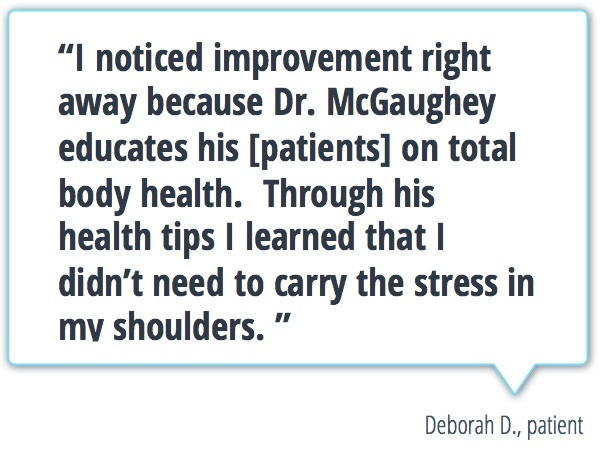 During your second appointment with Dr. McGaughey he will lay out a road map to help you attain the exact health goals YOU want to achieve. He will go over in great detail what he found in the neurological exam, explain everything so you understand exactly what is going on, how he will be able to help you, if further testing is warranted, discussing your care options from frequency of visits, the services you will need, and payment options to reach the health goals you have set out to obtain. Expect a difference and take action. Call us today 805.461.8822 to schedule your first consultation. Copyright 2012 McGaughey Chiropractic. ALL RIGHTS RESERVED.